We bought some shrimp to make an easy Sunday afternoon pre dinner snack. We realized, after returning home, that there was no horse radish to make cocktail sauce. Plan B, we have dry rub. 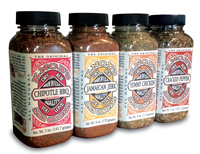 We ruled out Cracked Pepper Dry Rub and opted for the Jamaican Jerk and Chipotle BBQ Dry Rub. 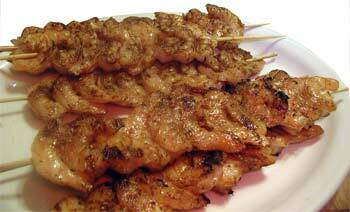 We peeled and skewered the shrimp and sprinkled with dry rub. We gently rubbed the shrimp for a minute and stacked them on a plate. We heated up our grill pan with butter and a bit of olive oil. Once it was hot we cooked the shrimp for a couple of minutes on each side until they became opaque. The shrimp was excellent! Especially the Jamaican Jerk shrimp. The Chipotle BBQ shrimp was a bit spicy but good as well. Next time we rub some shrimp we are going to toss them on a grill with some hickory chips.